Dublin Historical Society collaborates with Muirfield Village Garden Club once again. Learn more here. When: Dec. 2 & 9 from 2-5 p.m.
Where: Coffman Homestead at 6659 Emerald Pkwy. The Fletcher Coffman Homestead will once again come to life this holiday season for the City of Dublin Tree Lighting Ceremony and for An Old Fashioned Christmas at Coffman Homestead. For the first time last year, the Dublin Historical Society and the Muirfield Village Garden Club partnered to bring historical holiday decorations to the house. After touring and measuring the spaces, the garden club was able to decorate both the house and the barn with artificial trees, garlands, wreaths, candles and period décor. The house was so beautifully decorated that the garden club decided to submit the project to the National Garden Clubs, Inc., for recognition in the Decoration of a Historical Building category. The designs for the 2017 Old Fashioned Christmas at Coffman Homestead took first place not just in the state, but in the entire country as well. Make sure to visit the decorated homestead this season to see how the garden club improves upon last year’s design. The first floor of the house will be open and decorated for the public to freely enjoy during the tree lighting, but the entire homestead will be decorated the first two Sundays in December for An Old Fashioned Christmas at Coffman Homestead. Tickets can be purchased online or at the door for $5. Children 5 and under get in free. 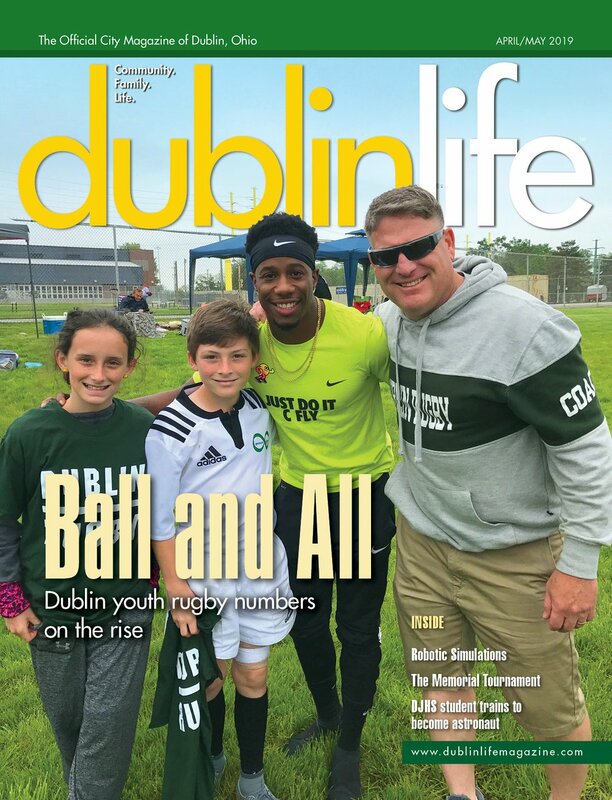 Dublin Life Magazine is excited to introduce Emma Mathews, our high school intern for the current issue. Mathews is a senior at Dublin Jerome High School and is a member of the Young Professionals Academy at Dublin City Schools’ Emerald Campus. Though she is still deciding between The Ohio State University and the University of Kentucky, Mathews’ future isn’t lacking direction. In addition to her academic pursuits, Mathews also swam competitively for 12 years and has several accolades to show for more than a decade of hard work. Mathews enjoys spending time with her parents, Colleen and Stephen; younger siblings, Connor and Sophie; and her two dogs; Bella, a black lab, and Harley, a miniature golden labradoodle.